April 7, 2015 | Dental Implants. If you’ve decided after consulting with an oral surgeon, that dental implants are the best option for you, here’s what you need to know about the implants. They’re convenient, natural, and long-lasting solution to replace missing teeth that were lost or extracted. It’s going to be best to follow your oral surgeon’s post-op instructions, but here are some general rules to follow. It goes without saying that you should not disturb the wound, yet some people have the urge to touch the area with their finger or tongue, but you must avoid this! Others rinse too hard or spit too much, which can impact the wound and slow down the healing process. Your oral surgeon may give you antibiotics and have you rinse with antiseptics to prevent infection, or there may be a prescription mouthwash or salt rinse, but whatever he tells you, follow the instructions. 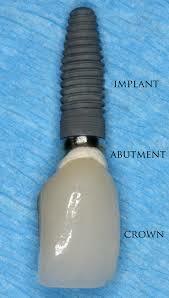 Don’t be fooled, dental implant surgery is still surgery and with that comes some pain. An anesthetic will be used during the procedure, but when that starts wearing off you may need a doctor prescribed medication or OTC pain medicine to help manage the pain. It’s natural to bleed for a day or so after the surgery, but if there is a significant amount of bleeding, you may need to bite on a gauze pad. Swelling may also occur for up to a few days after dental implant surgery, but may be minimized by using ice packs. If you experience excessive bleeding, pain, or swelling, tell your oral surgeon immediately and see if you need additional care. For a few days, you will want to drink plenty of fluids but avoid very hot or cold drinks and food. Keep to soft foods or liquids until you are comfortable resuming your normal diet. As with any surgery, you will want to make sure you get plenty of rest to give your body time to heal. Avoid exercise as additional blood flow could cause throbbing or gushing. Also, if you have a prosthesis such as dentures, you won’t be able to wear those for at least a week after surgery, but you should discuss this with your oral surgeon.